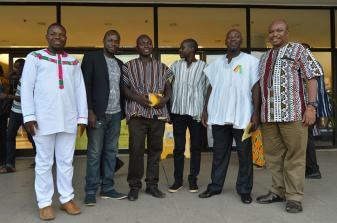 Last month, AfriKids Programme Manager, Joe Asakibeem, attended the MTN Heroes of Change Awards having been shortlisted for the prize, in recognition for his commitment to changing lives in his community. Joe went along to the ceremony in Accra with a few other members of the team including Ray, who tells us all about the evening here. 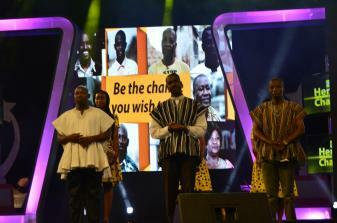 … the untold stories of Ghana’s Heroes being told in a spectacular way! The MTN Heroes of Change programme seeks to unearth and celebrate people who are giving back to their communities in extraordinary and impactful ways. The programme further seeks to celebrate the contribution of these heroes and heroines in the development of our society. The MTN Ghana Foundation believes that honouring people who make personal sacrifices for the good of their communities provides further motivation for continued good works. It is for this reason that the Foundation instituted the MTN Heroes of Change programme to honour, award and reward these heroes, and encourage more people to emulate their example. Madam Genevieve Basigha, a speech and hearing impaired lady who has established a special school at Obuasi to assist deaf children with education has been recognized and rewarded by the MTN Foundation as she emerged the overall winner of the third edition of the MTN Heroes of Change programme! She received a cheque as a contribution to her work and a plaque. The other finalist included AfriKids' Joe Asakibeem, Dr Michael Adusei-Nsowah, Ibrahim Bafara Alhassan, John Amankrah-Essel, Joana Mansah Deegbe, Nana Prof. Osei Kofi Darkwa III, Rev Fr. 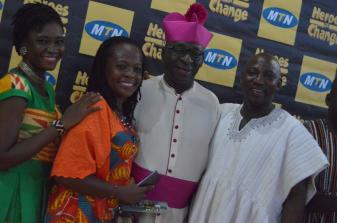 Dr. Moses Asaa Awinongya, Rev Monsignor Alex Bobby Benson and James Jack Dawson. “Joseph Asakibeem is based in the Upper East region and provides medical aid to children born with varying levels of disability. He also educates the community about the true state of these children’s conditions in order to dispel the false perception of them as spirit children, and thereby discourage the practice of killing deformed children." Each of the 10 finalists left with a contribution to their work, a certificate of recognition and a plaque to take home. engaged in education projects aimed at improving literacy and enabling members of the community to become agents of social change. dedicated to awareness creation and advocacy for healing or eradicating any indefinable health issue. engaged in projects aimed at building the capacity of members of a community in order for them to become self-sufficient and to enhance their livelihoods.